We’d love your help. Let us know what’s wrong with this preview of The Sixth Day by Catherine Coulter. To ask other readers questions about The Sixth Day, please sign up. I received a copy of this book for review and I’m eager to read it. However, because I have not read the previous books in this series, I’d like to know if it’s okay to read the books out of order? Thank you for your help. Throw in some drones, falcons, evil twins related to Vlad Dracula, an ancient book that no one can read, and a former agent of M16 now with the FBI and his sidekick paramour agent, Michaela and you have what makes for an engaging fast paced read. I enjoyed this book even though it had many unbelievable segments that seemed a bit touching on the sci fi genre. Nicholas and Michaela are on the trial of a ruthless man, Ramon, who is the millionaire owner of a tech company which specializes in computer programs that prevent hacking. Problem is Ramon has a secret twin who suffers from raging hemophilia and Ramon is desperately trying to find a cure. Problem is that Ramon's computer programs are present in most of everyone's computers plus those of governments throughout the world. What sounds noble however, masks the concept that Ramon does not care who or what he harms in order to attain his goal. He believes the answer to his brother's illness lies in an ancient book, the Voynich manuscript which no one supposedly can read, no one that is except Ramon, his brother, and Dr Isabella Marin. As mentioned Ramon is ruthless and will do anything he can to achieve his goal including using an army of sophisticated drones, falcons (yes the bird variety) and death and destruction. To thwart Ramon whose goal is eventually ferreted out by the agents Nicholas and Michaela, they embark on a life threatening mission to save the world, most especially England. The books follows the villains and the good guys as the final attack of London, Parliament, the Queen the Prime Minister, and even the American President swings into full gear. This book was a quick kind of escape from reality which incorporates possible vampires, blood drinking and assorted things that have come down in the Dracula legend. FBI special agents Michaela (Mike) Caine and Nicholas Drummond of The Brit in the FBI series are vacationing at Drummond’s family estate in England (of course it’s an estate), when they are asked to look into very strange assassinations and a ransomware attack on Drummond’s father’s company. As members of the FBI special Covert Eyes group they have special talents and resources and are tasked to go anywhere in the world where they are needed. Ladies and gentlemen: start your engines for The Sixth FBI special agents Michaela (Mike) Caine and Nicholas Drummond of The Brit in the FBI series are vacationing at Drummond’s family estate in England (of course it’s an estate), when they are asked to look into very strange assassinations and a ransomware attack on Drummond’s father’s company. As members of the FBI special Covert Eyes group they have special talents and resources and are tasked to go anywhere in the world where they are needed. Ladies and gentlemen: start your engines for The Sixth Day’s wild ride through London. There are several plot lines, but oddly enough they do manage to fit together in a very believable way; as long as you maintain the requisite suspension of belief in regards to the vampire plot line. So let me give you a quick summary of all you will have to prepare yourself for: the aforementioned assassinations and ransomware, more assassinations, the viral infections and security breeches into supposedly the best computer security in the world, attack falcons, manuscripts that can’t be read but talk to certain people, and a drone army. For spoilers sake I’m even leaving a few out. Sounds crazy, right? Well gather ‘round while I play know-it-all. The US government, until very recently did have the Russian owned Kaspersky Labs computer security company inside most government computer systems. By invitation. Recently our folks realized, Russian government security services might have gotten their hot little hands on ownership. Ooopsies. The US Air Force is looking into training falcons to take down drones. The Voynich Manuscript does exist, but has never been translated or stolen from the Beinicke library. Micro-dots of LSD are being looked into as a way to calm severe agitation. Ransonware does exist. So, I would have to say Coulter and Ellison do a fantastic job in searching out the obscure and arcane for their books and weaving it all together. Depending on their writing schedule, they might have been prescient too. I just wish they did a better job with actually putting words to page, so choppy and abrupt. In some places too melodramatic. The characters are so minor; the bad guys are far more interesting and better written. Not much chemistry between the Mike and Nicholas despite their being partners, both romantic and professional. As I’ve written before, I miss the days of Coulter writing romantic suspense. The chapter headings, especially the ones about falconry, may be among the best I’ve come across. One heading explains the traditional royal precedence for falconry ownership. The chapters on falconry were among the best written and most fascinating. The falcons alone return the stars I took away for the writing and characters. Coulter and Ellison’s explanations of computer vulnerabilities were clear and understandable, even for the non-techies. Actually their explanations were almost too good and had me eyeing my computer askance. So this was a mixed bag for me. If you like well done complex plots this is for you. If you like smooth writing and compelling characters, don’t hurry to read it. Unless you are a long time Coulter and Ellison fan as I am. I love this series with its quirky, sy-fi plots and, most of all, the wonderful mystery/suspense plots. "The Sixth Day" more than lives up to the other books in this series. There are several plot lines thorough out the book. It seems at times that Mike and Nicholas left their renowned instincts at home and I loved this book all the more for that little plot twist. They didn't Advanced Reader Copy (ARC) provided by the Author and Publisher via NetGalley in exchange for an fair and honest review. I love this series with its quirky, sy-fi plots and, most of all, the wonderful mystery/suspense plots. "The Sixth Day" more than lives up to the other books in this series. There are several plot lines thorough out the book. It seems at times that Mike and Nicholas left their renowned instincts at home and I loved this book all the more for that little plot twist. They didn't have all the answers, but that doesn't mean the baddie got the best of them. Nicholas Drummond and Mike are supposed to be on vacation with his family in London, England. Nicholas's grandfather, Baron de Vesci, is the head of a multi-million dollar cosmetics company and he has a computer problem, his system is being held for ransom. Nicholas, hacker extraordinary, takes a look and uncovers a whole lot of bad going on. Then, on top of that people are dropping dead, like the Vice-Chancellor of Germany on the steps of 10 Downing Street. A drone is spotted overhead and Nicholas's father asks him and Mike to help out. So much for a vaca. During the same time Dr. Isabella Marin, a young employee at the British Museum has discovered missing pages to a medieval text from the time of Vlad Dracul III. The enigmatic Voynich Manuscript is a text that no one has been able to decipher, and the Manuscript was stolen from Yale over a year ago. A Goodreads Giveaway Win! Yay! Special agents Nicholas Drummond and Michaela Caine are back again in Coulter’s “A Brit in the FBI” series after getting called in on a ransomeware attack and separately, the suspicious deaths of two high-level British politicians. I hadn’t heard of this series before but seeing J.T. Ellison’s name as collaborator got my attention. I so enjoy her writing. She along with Coulter? Jackpot! And indeed I was not disappointed.The chemistry and dynamics of the characters, the story’s originality and t Special agents Nicholas Drummond and Michaela Caine are back again in Coulter’s “A Brit in the FBI” series after getting called in on a ransomeware attack and separately, the suspicious deaths of two high-level British politicians. I hadn’t heard of this series before but seeing J.T. Ellison’s name as collaborator got my attention. I so enjoy her writing. She along with Coulter? Jackpot! And indeed I was not disappointed.The chemistry and dynamics of the characters, the story’s originality and topicality, with cyber-warfare, a madman and a drone army thrown into the mix made for a great read. Thanks to Gallery Books for providing an ARC in exchange for an honest review. I thoroughly enjoyed reading this book from beginning to end. It was full of adventure and no lack of excitement. The book is quite complex. Romanian lore, including Vlad Dracula, vampires, and the Voynich Manuscript, is interwoven with modern day warfare of drones, computer hacking, ransomware, and with a very unique use of falconry. Set in London, this the fifth in the series featuring FBI agents Nicholas Drummond and Michaela Caine. Political assassinations and a massive cyber security attack set them, along with M15, on a thrilling quest stop the attackers. The perpetrators are quite fascinating along with their reasons for committing these crimes. The way in which the author wove these complex ideas into a well paced and solid story is quite good and admirable. A little bit of fantasy? Maybe, maybe not. Possibly more futuristic in nature. Or frankly, much of it could be happening right now. I do wish the characters had been more developed, especially the two leads. Many times they seemed a little silly or flippant. Crises were solved too quickly and easily. This may be a matter of personal taste as I prefer a more serious and subtle approach. 3.5 stars rounded up to 4. Nicholas and Michaela are in London on vacation, but it doesn't take long for them to get consulted on a case. When filthy rich people are dying from a mysterious poison delivered by drones, they are asked to help. As the investigation plays out, there is major spying on government computers to deal with and the kidnapping of an American Professor. The culprit is known from the start, Ramon Radulov, who is the billionaire owner of a tech company which specializes in co 3.5 stars rounded up to 4. Nicholas and Michaela are in London on vacation, but it doesn't take long for them to get consulted on a case. When filthy rich people are dying from a mysterious poison delivered by drones, they are asked to help. As the investigation plays out, there is major spying on government computers to deal with and the kidnapping of an American Professor. The culprit is known from the start, Ramon Radulov, who is the billionaire owner of a tech company which specializes in computer programs that prevent hacking. Ramon has a secret twin who suffers from a rare form of hemophilia and Ramon is desperately trying to find a cure. He believes the answer to his brother's illness lies in an ancient book, the Voynich manuscript which no one can read, no one that is except Ramon, his brother, and Dr Isabella Marin. Ramon will stop at nothing to find the cure. Nicholas and Michaela, could be referred to as cowboys, as they will stop at nothing to save the world, specifically England. The story hits its final peak during an attack on British Parliament where the Queen, the Prime Minister, and the American President are all possible victims. Mix in a dash of Dan Brown's DaVinci Code, a splash of James Patterson's Private and a whole lot of originality from two very talented co-authors and what do you get? A page-turner of history-linked chills, thrills and intrigue that will keep you engrossed from beginning to end. In fact, I highly recommend the entire "Brit in the FBI" series (this one, I believe, is the fifth). Primary characters and friends with benefits Nicholas Drummond and Michaela Caine are on the special Covert Eyes FBI tea Mix in a dash of Dan Brown's DaVinci Code, a splash of James Patterson's Private and a whole lot of originality from two very talented co-authors and what do you get? A page-turner of history-linked chills, thrills and intrigue that will keep you engrossed from beginning to end. In fact, I highly recommend the entire "Brit in the FBI" series (this one, I believe, is the fifth). Primary characters and friends with benefits Nicholas Drummond and Michaela Caine are on the special Covert Eyes FBI team - one that plays well with the FBI's British counterpart (Nicholas is the first British agent to join the FBI). They've been called in amid what is thought to be assassinations of a couple of business and political bigwigs in London, with the hope that the team can sort things out and, needless to say, catch the culprit(s). As readers learn early on, the killings may be linked to the Castle of Vlad Dracul III in 1448 and a mysterious Voynich Manuscript that involves cryptophasia (a.k.a., a language of twins); the occasional chapter flips to days of old to trace the manuscript's footprint throughout its elusive history. The trail extends far and wide but seems to be tied to Roman Ardelean, the uber-wealthy owner of a cybersecurity firm that provides software to governments and businesses worldwide. Not insignificantly, he's also a descendant of Vlad the Impaler (often believed to be Dracula), and his twin brother, computer genius Radu, suffers from a particularly nasty and incurable form of hemophilia. The brothers are convinced that pages in the Voynich Manuscript - pages that have just turned up at a London historical museum after having been mysteriously "discovered" by Romanian expert Dr. Isabella Marin - spell out what Radu needs for a complete recovery. In between are real and threatened attacks by a cadre of seriously high-tech drones and seemingly low-tech but deadly falcons; whether or not they're all connected to the Ardeleans and the manuscript will put to the test the considerable computer skills of Nicholas and his team-member friend Adam in what might be called a battle of the programmers. Non-techies needn't worry, though; everything is explain well enough that even an aging grandmother like me can understand it (well, enough that it all made sense, at least). Interesting but overly long. Full review to come. The description made this sound like a very interesting book--spies, intrigue, ancient texts, even Dracula--but I had a very hard time getting through it. Perhaps all the threads didn't weave together well enough for me. There was a large team of operatives and I didn't feel engaged in their group dynamic. There was the back story of two twins from Romania, who were Dracula's brothers, along with several chapters from various time periods. There was the story line of two modern-day Romanian twin The description made this sound like a very interesting book--spies, intrigue, ancient texts, even Dracula--but I had a very hard time getting through it. Perhaps all the threads didn't weave together well enough for me. There was a large team of operatives and I didn't feel engaged in their group dynamic. There was the back story of two twins from Romania, who were Dracula's brothers, along with several chapters from various time periods. There was the story line of two modern-day Romanian twins and the struggle to keep the weaker one from death. And then there was the main conflict: a drone army built by a billionaire computer genius. Maybe if so many different things were not going on and the authors really focused on more vital plot lines, this book would have been more engaging to me. As it was it took me over a week to read it, and I really contemplated not finishing it several times. Nicholas Drummond and Michaela Caine are on a vacation in Great Britain that starts out with a computer hack and suspicious deaths of political leaders. British Security has been hacked. Every secret is exposed and key strokes can be seen on every system. The inventor of the security system that runs on the British system and systems all over is called in to fix the problem. Is the fox guarding the hen house? The story has chapters that take you back in time to Vlad the Impaler and Dracula. Supp Nicholas Drummond and Michaela Caine are on a vacation in Great Britain that starts out with a computer hack and suspicious deaths of political leaders. British Security has been hacked. Every secret is exposed and key strokes can be seen on every system. The inventor of the security system that runs on the British system and systems all over is called in to fix the problem. Is the fox guarding the hen house? Catherine Coulter with J. T. Ellison wrote an action packed book with a lot of dynamic characters. It's strength is the constant action with larger than life characters seeking to stop a mad(man or woman), who is killing world leaders using drones which deliver a fast acting drug. Can they stop him/her? What is the connection between these people dying? The quicker they make the connection the more quickly they can stop him. The story is full of bad guys with conflicting agendas. Add a dash of v Catherine Coulter with J. T. Ellison wrote an action packed book with a lot of dynamic characters. It's strength is the constant action with larger than life characters seeking to stop a mad(man or woman), who is killing world leaders using drones which deliver a fast acting drug. Can they stop him/her? What is the connection between these people dying? The quicker they make the connection the more quickly they can stop him. The story is full of bad guys with conflicting agendas. Add a dash of vampires and you enter the chase with them. For me, the good guys were plausible but pushed the limit of believability. I found the characterizations flat, I didn't identify with them or find them intriguing, this may not be an issue for many readers, who prefer action to a character study. Could the killing happen in the manner described, most definitely and the added dose of hacking even more so. I think this will be best-seller among mystery and thriller readers. The story was over 500 pages and it meandered a bit to long. The story could have been completed easily at 400 pages or less. For those not familiar with this series, you don't need to read previous stories to understand the story-line, it is great as a stand alone book. Available Now, pick up a copy today. Love this series. While reading a fast-paced, adrenaline-filled book, I'm also getting educated about so many different things in our world! This book refers to Dracula and the book of "twin talk" - so very interesting. Lots of techno stuff - drones in particular (kind of scary), falcons and their training (love that part) - very smart birds! Regular characters appear again, on an adventure they will never forget! 2 thumbs up and 4.5 stars (the "woowoo" is not my thing, ergo minus half a star). 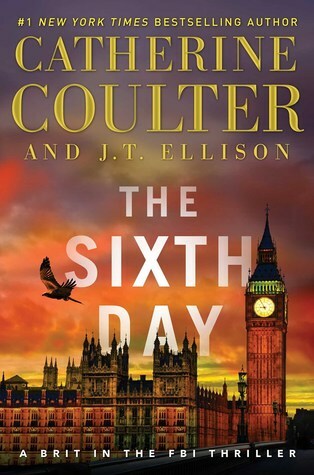 In The Sixth Day (Gallery Books 2018), Book 5 in Coulter's popular Brit in the FBI series, the stars, Special agents Nicholas Drummond and Michaela Caine are trying to take a much-overdue vacation, this one in England to see Nicholas' family. Before they even settle in, Nicholas' father asks him to help with a ransomware problem that has shut down his company computers and the FBI asks him (since he's already in England) to check out the suspicious death of a German political leader who drops de In The Sixth Day (Gallery Books 2018), Book 5 in Coulter's popular Brit in the FBI series, the stars, Special agents Nicholas Drummond and Michaela Caine are trying to take a much-overdue vacation, this one in England to see Nicholas' family. Before they even settle in, Nicholas' father asks him to help with a ransomware problem that has shut down his company computers and the FBI asks him (since he's already in England) to check out the suspicious death of a German political leader who drops dead in front of 10 Downing Street. With the aid of Drummond's genius computer geek, the ransomware is quickly solved solve but not so the death. In fact, Drummond and Caine tie it to several other suspicious deaths that were previously considered natural causes and are now looking more like murder. The weapon of choice: drones. In a time when drones are all over the place with little control and lots of variety, this addresses the terrifying fear of how easily they can be weaponized. My one complaint is that too often, the author goes a sentence too far in explaining his points. I get it, move on, and he's still talking. It makes me want to skip ahead. Not good for a murder mystery. But, I've read every book in this series, enjoyed them all, so there's no chance I won't keep reading because of a pesky complaint about too many words. I'm sorry to say this book is OK but not one of my favorites. It took me way to long to read the book for one thing. I continually put it down then came back to it a day or two later. I like the procedural and the characters. However, I never connected completely. I don't blame the author though. I believe part of the problem is because I started the series with book 5. Even though The Sixth Day is supposed to work as a standalone, and the criminal mystery story arc does, I don't understand the I'm sorry to say this book is OK but not one of my favorites. It took me way to long to read the book for one thing. I continually put it down then came back to it a day or two later. I like the procedural and the characters. However, I never connected completely. I don't blame the author though. I believe part of the problem is because I started the series with book 5. Even though The Sixth Day is supposed to work as a standalone, and the criminal mystery story arc does, I don't understand the main characters, their partnership, or the dynamics of their relationship. I'm sure there is a lot of character development in the first four books. Terrorism has taken hold and many top political figures are mysteriously dying with the use of high tech gadgets. The Covert Eyes Team may be the only ones capable to stopping this madness but will it be too late? With the help of Dr. Isabella Marin, an expert in Voynich Manuscript and cryptophasia (twin language), Nicholas and Michaela vow to end the reign of Roman Ardelean, a ritzy cyber security wiz and a descendant of Vlad Dracul III-aka - Dracula. Will the Voynich Manuscript help in unlocking Terrorism has taken hold and many top political figures are mysteriously dying with the use of high tech gadgets. Will the Voynich Manuscript help in unlocking the blood secret in time to save Roman's twin brother (Radu) who is suffering from autism and a blood born illness. Tension mounts with heart pounding action as more and more victims fall prey to the wrath of a madman. Can his dangerous tactics and trickery using drones for his own personal advancement as his elite army end without more blood shed? Perhaps money is at the root of all evil and in this ponzi scheme scenario the only one getting wealthy on the deal are the ones at the top holding all the cards. I can't imagine blood being a motive for murder but in this case you just never know. The FBI is hot on the trail though and may soon uncover the truth to the falcons, spyware, malware, hidden weaponry of mass production, personal armies, and weaponized drones that are wreaking havoc upon London and beyond. We are in the heat of the moment as Russia and N. Korea seeks advancements using any means necessary and sadly terrorism, cyber warfare, chemical warfare may be the weapons of choice. When paying for weapons ultimately leads to investors dying with a strong v weak brother in charge we know we are all doomed. Enter the masters and special agents who hopefully can bring law and order back to this suspenseful and gripping masterpiece. Thank you to Catherine , her publishers, NetGalley, Aldiko for this advance e-read ARC copy and my very special 2nd home The Hoyt Library for the hardcover backup version. This was so entertaining that I read it in one sitting all 500+ pages and never once lost interest. In fact I couldn't turn the pages quick enough! Remarkable story telling here. The Sixth day Has everything readers have come to love from Catherine Coulter and J.T. Ellison. The characters are dynamic, the story is flawless with the mix of history, suspense, and intrigue. Reader will be caught up in The 6th day that won't realize they have been reading it non stop. While the story is a little over the top it will keep readers hooked with the amount knowledge these authors have on the subjects they present to the reader. Thank you to Netgalley and the publisher Gallery Books The Sixth day Has everything readers have come to love from Catherine Coulter and J.T. Ellison. The characters are dynamic, the story is flawless with the mix of history, suspense, and intrigue. Thank you to Netgalley and the publisher Gallery Books for the advance copy. Wow! This book was so scary in the idea that drones and hackers are in todays news. Like usual, the latest instalment in the Brit in the FBI series kept you at the edge of your seat from page 1. I really liked the history sections in the story; very interesting. I really love Mike and Nicholas; they are great characters. I love Adam, he is fabulous. And yet another spectacular adventure from Coulter and Ellison. I hope these ladies keep this series up for a long time. I love watching Nicholas and Mike work together to solve life-threatening puzzles to save the world from the crazies. It appears Coulter and Ellison are still fascinated with twins. Same as the previous book, the villains are a set of crazy, brilliant twins who wanted to control the world. Again, we have Drummond and Caine being asked to investigate, even though they are FBI holidaying in London! It's like as if Scotland Yard, MI5, MI6 and the Home Office are all useless. The book revolves around the Voynich manuscript, which is actually real. It's a manuscript dated back to the medieval times and nobod 3 stars. The book revolves around the Voynich manuscript, which is actually real. It's a manuscript dated back to the medieval times and nobody has yet been able to decipher it. In this story, we are led to believe the manuscript is only readable by twins of a Romanian background and is written in their own secret language. The authors managed to bring Bram Stoker and Dracula into the mix. Nicholas Drummond, The Brit in the FBI is back in the UK with all pistons firing!!! He's joined by girlfriend Michaela (Mike) Caine on a vacation that turns into a duel with the descendants of Vlad the Impaler, yes Dracula himself. This latest novel in the series begins simply enough with what appears to be a hack into the British security service systems, enabling the evildoer to see not only what lies secret in the servers, but also reads keystrokes so they can also see anything that was typed Nicholas Drummond, The Brit in the FBI is back in the UK with all pistons firing!!! He's joined by girlfriend Michaela (Mike) Caine on a vacation that turns into a duel with the descendants of Vlad the Impaler, yes Dracula himself. This latest novel in the series begins simply enough with what appears to be a hack into the British security service systems, enabling the evildoer to see not only what lies secret in the servers, but also reads keystrokes so they can also see anything that was typed anywhere. Nicholas and the Covert Eyes team to the rescue only to learn that the breach is more significant than originally thought. This lapse blossoms to include putting US security systems at risk. Call in Roman Ardelean, the inventor of the security system to figure out what went wrong and how he's going to fix it. Meanwhile, world leaders are dropping like flies…well not really. More like dropping like tree frogs…dead from a deadly tree frog poison. Wait, is that a drone? How does it all connect or does it all connect? Couple that with the appearance of a mysterious ancient script, an expert in archeology and you have the team chasing down all sorts of leads that don't seem to be leading anywhere. This series has always been a light enjoyable read, but this volume suspends belief a bit too far, becoming almost a comic type of adventure. The chapters that are ancient history are useless and slow down the reader unnecessarily, without adding value to the plot, that is often repeated later in the novel. The addition of Nicholas father as an aging former spy, now a consultant to the British services is a good one and I hope we see him and his wife in another novel. While this series has great possibilities, I hope the author focuses on a tighter story line and continuing character development that will make for a more compelling novel next time. It was good to read another book about the adventures of Nick and Mike. This one intersperses the history of Vlad Dracul III, vampirism, Romanian gypsy lore, possible ties to Rasputin and Bram Stoker with modern day cyberwarfare and very futuristic drone technology. The plot was quite enjoyable and very fast paced but sometimes, it was hard to keep track of the various intersecting plot lines. I was fascinated by the whole mystery about the Voynich manuscript and how it was ingrained into the evi It was good to read another book about the adventures of Nick and Mike. This one intersperses the history of Vlad Dracul III, vampirism, Romanian gypsy lore, possible ties to Rasputin and Bram Stoker with modern day cyberwarfare and very futuristic drone technology. The plot was quite enjoyable and very fast paced but sometimes, it was hard to keep track of the various intersecting plot lines. I was fascinated by the whole mystery about the Voynich manuscript and how it was ingrained into the evil twins in the story. My only problem was that the various interactions in the book didn’t feel right , especially the ones between Nick and Mike felt very off and sometimes even silly and not really like them. Why did it take me this long to pick this book up , I can see why my friend Robin loves this series , because it pulls you in once you start to read and then your hooked and don't want to stop reading it, love how the author mixed the past with the present , love how she brings the characters to live , now I want to read the rest of the series . Even though this is the only book of her's I've read ,this story has some touches to it that reminds me of James Rollins books , which I love to read, so happy that I found a series that is like my favorite series by James Rollins, with that said I want to thank Netgalley for letting me read it and review it . Thank you to Goodreads Giveaway for a free copy of the book, as well as the publisher and author. As always, an honest review. Drones, falcons, cyber warfare, and boots on the ground police determined to solve the mystery of multiple high ranking officials' deaths pretty much sums up this action packed book. In general The Sixth Day was good but not great. I enjoyed the page turning action packed intensity of it. I even finished the last 200 pages in an afternoon. The story is extremely relevant t Thank you to Goodreads Giveaway for a free copy of the book, as well as the publisher and author. As always, an honest review. I enjoyed the page turning action packed intensity of it. I even finished the last 200 pages in an afternoon. The story is extremely relevant to this day and age. It's even more terrifying, because with technology these sorts of crimes are possible. Definitely creeps me out a bit! The entire book takes place over six days, which works wonderfully. However a major premise of the story wasn't a great fit for me as a reader. The foundation of the mystery is the legend of Dracula and The Voynich Manuscript. Ancient curses, bloodletting, twin powers, secret texts and languages. If that's what you love in a book, then you will probably enjoy the story even more than I already did. This sort of fantasy folklore aspect isn't my cup of tea, so I enjoyed the actual investigation more than anything else. Also at over 500 pages, the book was too long. I thought it could be shortened by maybe 50 to 100 pages.